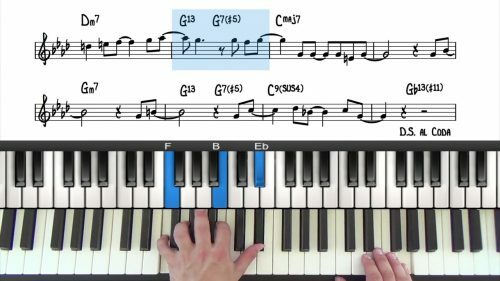 In this lesson we look at the tune ‘This Masquerade’ by Leon Russell. Released in 1972, This Masquerade is quite a modern tune compared to most of the jazz standards we have covered on PianoGroove. We start off the lesson by having a quick look over the lead sheet to talk about the form and the structure of the tune. Then we play through with left hand voicings and the melody. 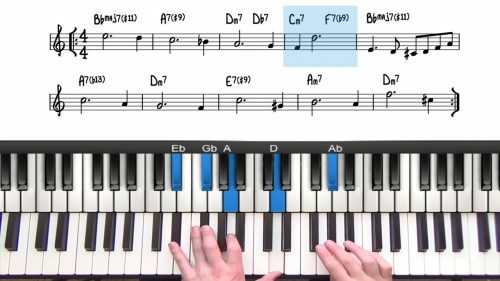 Remember that whenever you are trying to learn a new tune, always play through first with left hand voicings so that you get a good grasp of the harmony and the melody. We then add in some bigger two handed voicings and look at ways we can voice the vamp which is an intro and outro to the tune. In this lesson we explore how you can navigate over the minor line cliché using bass lines, two-handed chords and left hand voicings. Play just the melody of the tune with a metronome until you can play it accurately and up to tempo. 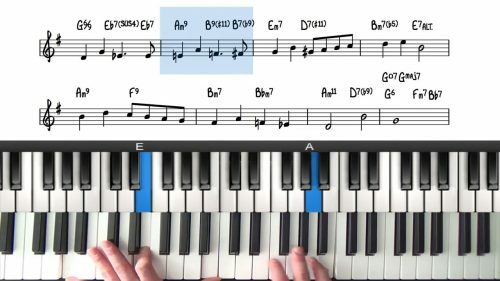 Next play the melody with left hand voicings to get a good understanding of the harmony. Also make sure you listen to a few vocal arrangements of the tune, which will help you with phrasing the melody and also give you some insight into the meaning of the lyrics which you can then try to convey in your playing.